The Highlands of Scotland is making a pitch to attract more golfing visitors from China, one of the most important emerging tourism markets. A delegation from Highland Golf Links (HGL), a promotional body representing three of the area’s finest links courses and four major hotels, is today (Friday) attending the China Golf Show, one of the largest trade events in Asia, to ensure the region is on the visiting golfers’ itineraries. China, which has a rapidly growing economy and one million registered golfers, offers huge potential to Scottish tourism. VisitScotland figures show that China is one of Scotland’s emerging international markets, and in 2013 visitors from China made 34,000 visits to Scotland, spending a total of £34 million. The country’s importance as a growing market was emphasised when the then First Minister Alex Salmond led tourism and trade missions to China in 2009 and 2010. Chinese tourists are said to spend more than the average overseas visitor and value key items such as whisky, bagpipes, tartan, castles and golf, making the Highlands an obvious destination. 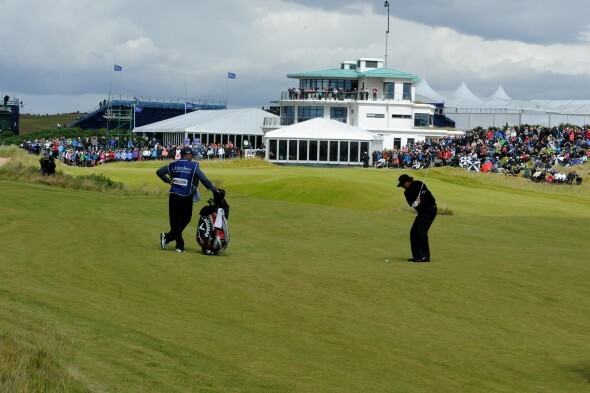 Golf tourism is a major contributor to Scotland’s economy and is estimated to be worth close to £220 million annually, with forecasts of reaching £300 million by the end of the decade. Neil Hampton, general manager of the world renowned Royal Dornoch Golf Club, and Stephen Laurie, sales manager at the four-star Kingsmills Hotel in Inverness, are representing HGL at the China Golf Show, which runs until Sunday in Beijing, in an event coordinated by Scottish Enterprise and Scottish Development International to raise awareness of golf to the outgoing Chinese tourists. Neil Hampton said: “Golf has grown rapidly in China and so we are looking to put ourselves in front of the decision makers for those that wish to explore the game outwith their boundaries. HGL includes Castle Stuart Golf Links, which will host the Scottish Open for the fourth time in six years in 2016; Royal Dornoch Golf Club, which is consistently in the Top 10 list of the world’s best golf courses; and The Nairn Golf Club, previous host of the Walker Cup and Curtis Cup and home to the Home Internationals tournament in 2016. The partnership also includes the Kingsmills Hotel and Culloden House Hotel, Inverness; the Royal Golf Hotel, at Royal Dornoch; and the Golf View Hotel and Spa in Nairn. The group promotes Play and Stay packages in the Highlands to encourage golf tourism. The China Golf Show is the country’s leading golf industry trading and sourcing event. It showcased over 480 brands and welcomed over 18,000 visitors in 2014. It attracts golf course executives, industry professionals and golf enthusiasts and includes an indoor equipment testing centre, fashion show, new product centre and innovation area as well educational seminars. Golf is certainly expanding in a big way in Asia, particularly in China, however it still remains very much a “rich man’s sport” in many areas within the country. This is perhaps an opportunity to promote golf tourism in Scotland, given the scenario that a package vacation to this country may in fact be cheaper than a basic membership in many parts of Asia. It will be interesting to see whether the explosion in terms of golfing numbers is repeated in levels of golf tourists from this part of the world.